Bonn, 18 October 2017 - Two influential UN-related wildlife bodies are proposing to join forces on a new initiative to halt the serious decline of Africa’s great carnivores. The Convention on Migratory Species (CMS) and the Convention on International Trade in Endangered Species of Wild Fauna and Flora (CITES) will submit their plan to the CMS COP12 wildlife summit in Manila later this month. Proposals for inclusion of the Lion and Leopard on CMS Appendix II will also be discussed at the meeting. The African Carnivores Initiative follows on from the CMS-CITES Joint Work Programme 2015-2020, which has been agreed by both Conventions. If adopted, it is intended to become a shared platform for the implementation of resolutions and decisions on lions, leopards, cheetahs and wild dogs under both CMS and CITES*. The two conventions would look to pool their resources and expertise in a drive to deliver concrete action and policy guidance in tandem with other organizations such as the International Union for Conservation of Nature (IUCN). CMS and CITES have already cooperated in bringing all African Lion Range States together in Uganda in May 2016 to identify the key measures needed to conserve lions across Africa. 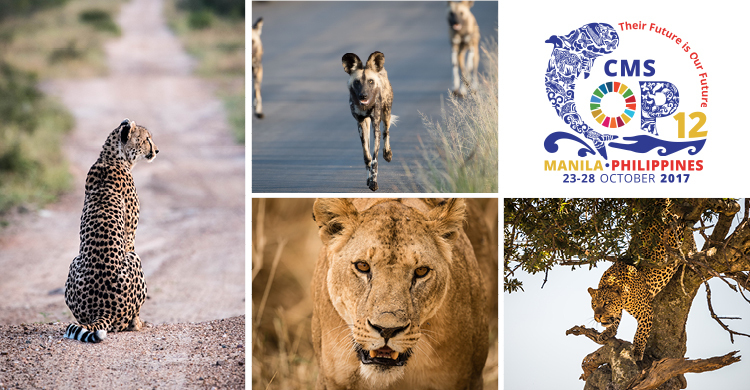 CITES COP17 also adopted a set of decisions on the conservation and management of the Lion and the Wild Dog, which call for the collaboration of the two Conventions. According to IUCN, the African Lion, Cheetah, Leopard and Wild Dog are in constant – and sometimes severe - decline across the African continent, except for Lions in Southern Africa, where there has been a slight increase. The IUCN Red List of Threatened Species, assesses the extinction risk of a species according to specific criteria. The 2015 Red List assessment of the African Lion suggests that Lion populations overall have experienced a decline of 43 per cent between 1993 and 2014. The classification of the species in the IUCN Red List remains Vulnerable, noting that most populations outside of Southern Africa (including Botswana, Namibia, South Africa and Zimbabwe) are assessed as Endangered (East and Central Africa) or Critically Endangered (West Africa). Despite challenges in estimating exact figures for the abundance of the Cheetah across Africa due to the scarcity and the naturally wide range of the species, the 2015 IUCN Red List Assessment estimates a 30 per cent population decrease over the past 15 years based on the established parallel decline in Cheetah habitat. The Cheetah is classified as Vulnerable on the IUCN Red List and as Critically Endangered in North-West Africa. According to a recent study, the classification of Vulnerable might not be appropriate given that 77 per cent of Cheetahs occur outside of protected areas and are therefore not included in population assessments. Since the Cheetah faces multiple threats outside of protected areas, scenario modelling has shown that the extinction rate might be significantly higher than in protected areas and would require a classification of Endangered for Cheetah on the IUCN Red List. The 2016 IUCN Red List Assessment for the Leopard estimates a decrease of over 30 per cent in populations across Sub-Saharan Africa over the past 21 years, in line with severe declines in prey species and the expansion of agricultural land. The decline in West and East Africa is estimated at more than 50 per cent. The Leopard thus falls within the classification of Vulnerable in the IUCN Red List, having been uplisted from the classification of Near Threatened in 2015. The Wild Dog is classified as Endangered under the 2012 IUCN Red List Assessment. Although data deficiency complicates population estimates, the IUCN Assessment estimates that an overall decline of 17 per cent took place between 1997 and 2012. The decline was most pronounced in Central Africa and Southern Africa, where populations decreased by around 26 per cent over the same timeframe. Experts say that carnivores are vulnerable to a number of threats, as a result of habitat loss and fragmentation due to expanded human settlements and agricultural activities; conflict with humans protecting their livestock; a decline in the numbers of animals on which they prey; and unsustainable and illegal trade in specimens of large carnivores. As a result, the Lion only occurs in 17 per cent, the Cheetah in 9 per cent, the Leopard in 51 per cent and the Wild Dog in 6 per cent of their historic range across Africa. * Both CMS and CITES Appendices are an indication of the degree of protection afforded to a species. The Cheetah is listed on CMS Appendix I and Wild Dog on CMS Appendix II. Wild Dogs are not listed on CITES because they are generally not traded, but the Lion is listed on CITES Appendix II, while the Leopard is on Appendix I and the Cheetah also on Appendix I.